SUBHEAD: The nuclear catastrophe at Fukushima Daiichi nuclear plant isn't over - it has only begun! Image above: Reactor #3 experiences a "prompt criticality". The dark smoke in the plume include uranium and plutonium particles that traveled far in the wind. 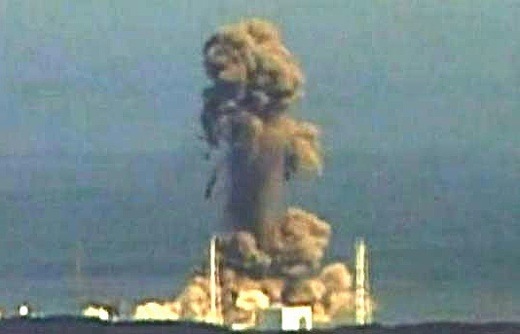 From (http://www.theguardian.com/world/video/2011/mar/14/fukushima-nuclear-plant-reactor-explosion-video). Today is the 3rd Anniversary of the Tohoku Earthquake that devastated Japan in 2011. Beyond the structural damage of the worst earthquake in Japan's history the event generated a mammoth tsunami that wreaked havoc on much of the northeastern coast of Honshu Island. It is the largest and most populated island in Japan and where Tokyo is. Most notably, the earthquake and tsunami led to the destruction and meltdown of three of the six nuclear reactors and the Fukushima Daiichi Nuclear Power Plant in Fukushima Prefecture 160 miles from Tokyo. All six reactors were General Electric Boiling Water Reactors. Reactors 1-4 were built low and close to the ocean. All four were destroyed by the cascading disasters resulting from the initial earthquake, the subsequent tsunami (which incapacitated the reactor water cooling pumps at the harbor's edge) - the resulting loss of power from high voltage tower failures, then loss of backup generating capability due to flooding in the basements where the diesel generators were inexplicably located. Reactor 4 was shutdown at the time the tsunami hit the site. Reactors 5 & 6 were built on a higher bluff and escaped the wave damage and immediate loss of core cooling. However, Reactors 1-3 were operational and could not be kept sufficiently cool. All three of those reactors went through complete core meltdowns. For a detailed history see (http://en.wikipedia.org/wiki/Fukushima_Daiichi_nuclear_disaster). Now those three reactor cores have been transformed into "corium", a lava-like molten mixture of portions of the nuclear reactor cores that include uranium and plutonium. Half-lives of major elements of corium range from 24,000 years (plutonium 239) to 4.5 billion years (uranium 238). The three reactors were sited at the bottom of a valley, at the edge of the ocean, with an unrelenting flow of water into the sea. Those cores have burned through their containment vessels, and through the foundations of their containment buildings, mixing with the water table below and flowing directly into the pacific Ocean. Tepco (Tokyo Electric Company) is the owner/operator of the this and other nuclear sites. They are a for profit corporation and have spent great effort of keep the public from knowing the implications and dangers associated with this disaster. They have been late to admit failures and risks at every turn. They have been late to take action when needed. They have used public relations, obfuscation, concealment and lies to downplay danger as well as duck responsibility. Only a feeble effort by Tepco has been made to mitigate the problem of radioactive water entering the Pacific Ocean. Their water filtering and water storage programs are useless. They have made no effort to entomb the disaster site. They did not bite the bullet, as the Soviet Union did in 1986 with Chernobyl, and immediately throw whatever man power, money and resources were needed to staunch the wound. They would have lost money and face. Prime Minister Shinzo Abe has just released plans to restart its 48 commercial nuclear reactors. Japan cannot compete in international markets if they have to import expensive fossil fuels to keep industry humming. They know that the Japanese economy (in a recession lasting 20 years) will never "recover" without the use of their 48 nuclear power plants to run industry like their Toyota assembly lines or Hitachi heavy industrial manufacturing ventures. The Japanese government (and media) have been partners in crime through this catastrophe by down playing the impact of "hot" particles and "low-level" radiation on the environment and the Japanese people. They suppress news, change safety regulations, and look the other way as organized crime has taken over "cleaning up the mess". To stem the damage and clean up Fukushima Japan will need a commitment at least as great as our Federal Reserve is willing to spend to hide the hollowness of our "Too-Big-To-Fail" banks - How about a $trillion dollars a year for starters? Three years on the problems at Fukushima Daiichi have not ebbed at all. They have gotten worse, but are larglely out of the public discourse. There will be no end to the flow of radioactivity into the Pacific Ocean in our life times, and likely not in our grandchildren's lifetimes. The Fukushima Daiichi site has become icreasingly difficult to manage due to rising levels of radioactivity, crowding of radioactive water storage, untrained "employees", loss of onsite veterans overexposed to radiation. As we have written before - every effort should be made to move spent radioactive fuel off the site to safer locations where it can be managed better. We are talking about thousands of tons of material. The levels in the Pacific Ocean of Cesium 137 (with a half-life of 30 years) will only increase. We are using the largest body of liquid water (and source of life) as a petri dish in a madman's nuclear experiment. Mutations in ocean life will occur, contamination will move up the food chain, immune systems will be compromised, mega-fauna (including humans) will die. The nuclear catastrophe at Fukushima Daiichi nuclear plant isn't over - it has only begun! The NRC spokespeople sometimes had trouble following the public debate, because for days their computers were blocked by security rules from accessing Twitter and YouTube. [David McIntyre, Mar. 12, 2011:] Just saw an incoherent discussion on CNN by Bill Nye the science guy who apparently knows zilcho about reactors and an idiot weatherman who said Hydrogen explosion? Pfft. I’m not buying it. His boss sent back the following reply, correcting the staffer and explaining plans to ask the Obama administration to help blunt critical news coverage. [Eliot Brenner, Mar. 12, 2011:] There is a good chance it was a hydrogen explosion that took the roof off that building, though we are not saying that publicly. [...] I have just reached out to CNN and asked them to call (former NRC Chairman Nils) Diaz, and reached out to push the white house yet again to start talking on background or getting out in front of some of this crap. ABC News (Australian Broadcasting Corporation), Matthew Carney, Mar. 10, 2014: A nuclear industry insider has told the ABC that the situation at the stricken Fukushima reactor is still not under control [...] At the risk of losing his job if his identity is revealed, a senior TEPCO staffer, who has worked at the Fukushima plant for more than 20 years, says the situation at the reactor is not under control and no-one knows how to fix the problem. [...] The whistleblower says mistakes are made weekly, and contaminated water leaks into the Pacific Ocean every day. [...] The insider says the damaged reactors can never be decontaminated and that people should not be moved back into the no-go zone, a 20-kilometre exclusion area around Fukushima.